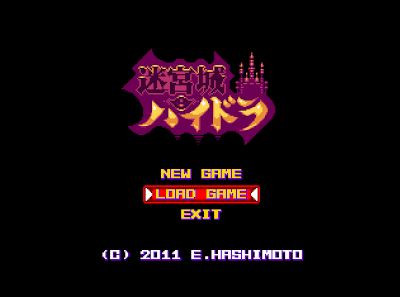 RGCD briefly mentioned Hydra Castle Labyrinth in one our first news posts last year, a platform adventure game by indie gaming mogul E. Hashimoto (Buster). Now with the release of a patch translating almost all of the in-game text to English I bravely volunteered for the hard and painful job of playing and writing about this delightful little dungeon basher. On firing the game up the first thing that seized my attention was the soundtrack, an insanely upbeat and incessantly enthusiastic score that makes me want to quit my job to run around dungeons stabbing things. I let it run for a good few minutes before I even left the first screen, and happily enough the gameplay fails to disappoint. 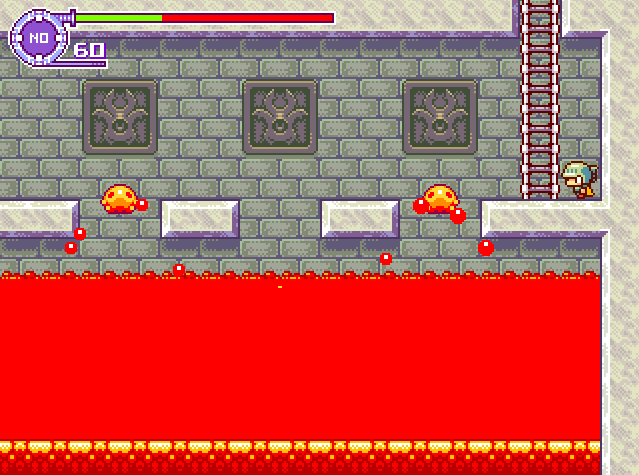 There's an obvious touch of the Castlevania/Metroid series all over the game, but with the cutesy dial turned to maximum and then ripped off. 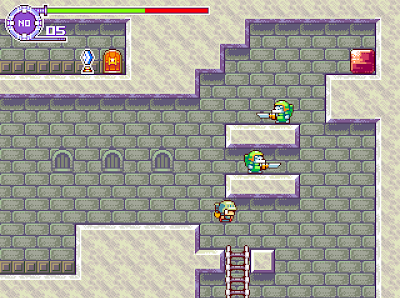 The game sees our hero, a superdistorted knight with an enormous helmet (stop sniggering in the back) tackling various enemies while attempting to escape from the dungeon in which he has been imprisoned. There's a fair amount of leaping and falling, and a metric ton of backtracking, which is par for the course in this kind of game. 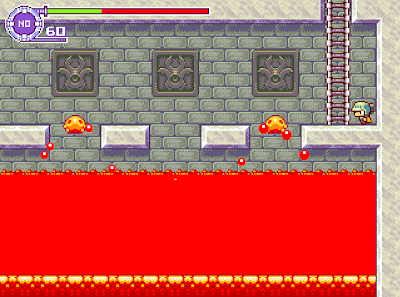 Hydra Castle Labyrinth undeniably delivers excitement and tension (at one point I found myself saying "shitshitshitshitshit" over and over again because I had to make what I was convinced was going to be a difficult jump over lava with only about a centimetre of health bar left) but one little crack in the game's superstructure niggles at me, and I can't let it lie. The inability to jump off ladders really bugged me. The game overall plays really smoothly, but it really clunks up when every gamer instinct tells you you should be able to leap off a ladder, and you're instead forced to climb up or down the whole thing. That's my one and only beef with Hydra Castle Labyrinth, which is otherwise a solid, fun and charming experience. The graphics and gameplay are a reminder, as if one was needed, of just how great a time the heyday of 8 and 16-Bit platform adventure games was. There are some well thought out graphical flourishes; I especially like the little cloud of dust kicked up when our hero is injured and falls from a height, and the pink bubbles that rise from the character when he's been poisoned by gas are cute in a dying-slowly-from-poison sort of way. It's quite a short game, but there's enough challenging gameplay to stop the player blasting through it in twenty minutes then uninstalling it. Running it on a laptop led to a bit of lag, with some quite heavy CPU usage, but it ran fine on my much older desktop PC (a hideous Frankenputer made of the corpses of at least three other PCs). I'm told that the game is automatically compatible with PC joypads, which is a nice feature that unforunately I couldn't test. Hydra Castle Labyrinth isn't without its flaws, but the pros of the game outweigh the cons. As freeware it's a total steal; I've seen much worse games on sale for actual money. It's also really pleasant to see new platform adventure games of a high quality are still being released. Download the English-patched game here (from the RGCD server).